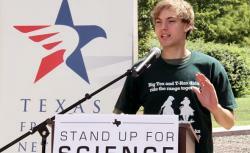 Texas science textbooks: Creationists try to remove evolution from classrooms. Creationists corrupted state education standards and may push evolution out of textbooks. Texas Freedom Network’s rally before the state Board of Education meeting on science textbooks in Austin, Texas, on Sept. 17, 2013. The Texas state Board of Education is in the process of adopting new science textbooks that will be used in public schools for the next decade. On Tuesday, the board held its first hearing for public comment on which textbooks should be adopted. Creationists came out in full force and demanded that “biblical truth,” rather than evolution, be presented in the state’s biology textbooks. These anti-science activists could compromise the teaching of evolution all across the country. They’ve been working toward this moment for years. In 2009, the Texas state Board of Education adopted new science standards. The standards presented to the board had been written by a group of scientists and educators, and the proposal covered evolution fully. More than 50 science organizations endorsed the original standards, but creationists successfully amended them. Now the standards include loopholes that allow evolution to be attacked and creationism to be snuck into public school classrooms. These requirements sound reasonable; we all want students to think critically, analyze, and evaluate. But these standards are designed to bring non-science into the classroom under the cover of analyzing, evaluating, and critiquing evolution. These standards are already harming Texas students, but now they are poised to damage science education all across the country. Because Texas buys textbooks for more than 4 million students, publishers tend write textbooks designed to capture the Texas market. They then sell the same textbooks in other states. If textbooks in Texas don’t teach evolution, the entire country will suffer. Texas Freedom Network rally on Sept. 17, 2013. Four years later, it’s clear she was right. The state Board of Education requires every textbook that it adopts to meet the science education standards that include the creationists’ amendments. Creationists have used the “analyze and evaluate” requirement to call for any textbook that doesn’t challenge evolution to be rejected. The first step in this year’s process of choosing new textbooks came when the board appointed reviewers to comb through biology textbooks, offer revisions, and determine which books should be adopted. If a book fails to receive top reviews and isn’t amended in response, publishers will have a very hard time selling that book in Texas. These textbook review teams should have been filled with experts, but instead creationists on the state board managed to get other creationists appointed to review the books. The review teams included fellows from the Discovery Institute, a creationist think tank, and even an employee of Probe Ministries, a creationist apologetics organization out of Dallas. On Tuesday, at the state Board of Education meeting, I watched as creationists defended these reviews and argued for rejecting science-based biology textbooks. Barbara Cargill, the creationist chairwoman of the state board, argued that creationists—with no expertise in biology—were qualified to review the textbooks. Board member Ken Mercer complained that people were losing their jobs for questioning evolution and said, “That should never happen in a place called America.” Board member David Bradley questioned outright the separation of church and state. Because the exact words separation of church and state don’t appear in the First Amendment, Bradley claimed, there is no separation of church and state. McLeroy helped pass the creationist standards in 2009, and he believes they have been effective in undermining evolution in textbooks already. “Even though these biology books are full of unsubstantiated, dogmatic statements supporting evolution, there’s still two major reasons why you should adopt these books,” he said at the hearing. “By so doing, you will strike the final blow to the teaching of evolution,” and these books “coincidentally happen to support what the Bible said.” McLeroy said that the evidence for evolution in the textbooks is “weak” and there are “hidden jewels” that will allow smart creationist students to destroy evolution. Zack Kopplin speaks at the Texas Freedom Network rally. I disagree with McLeroy about that, and so do the experts. Scientists at the University of Texas at Austin and Southern Methodist University have gone over the textbooks and concluded that they teach evolution well. Whatever McLeroy thinks personally, his endorsement could help us keep evolution in schools. Evolution is real, and it should be taught in Texas textbooks. A board vote in November will determine which textbooks are adopted. I hope the board does the right thing and adopts new biology textbooks that teach science without any unscientific revisions or disclaimers that would undermine the teaching of evolution. Thankfully, there is a good chance that this will actually happen. 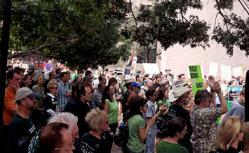 Hundreds of Texans showed up in support of good science. The majority of testimony before the board supported science textbooks. 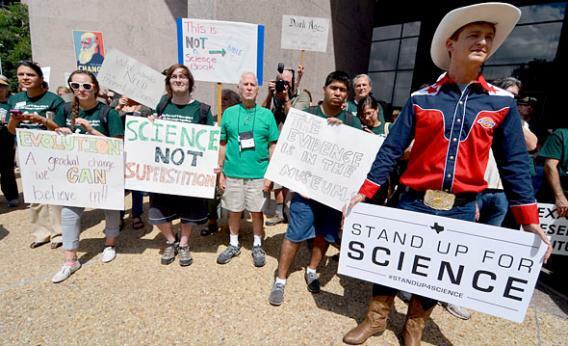 The Texas Freedom Network held a rally before the hearing where hundreds of people wore green shirts that said, “Big Tex and T-Rex didn’t ride the range together.” More than 300,000 people signed petitions urging the board to keep science in the textbooks. Several pro-science board members—Ruben Cortez, Marisa Perez, and Martha Dominguez—attended the rally and affirmed their strong support for teaching evolution. I hope the rest of the board will join those three in supporting science education, and for those members of the state board who don’t want evolution in the textbooks, at the hearing, I proposed an experiment for them: Search “creationism” on MonsterJobs.com, then search “biology,” and decide which is better to teach children.